Faithful spouse prefers watching a report of dead people on TV (who died this year?) over spending time with me. I guess I deserved that after bringing the mud incident home. 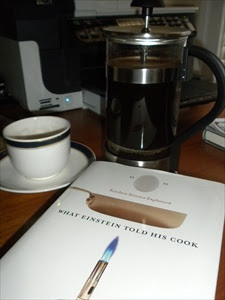 So I retreat to one of my favorite indulgences: French Press coffee and a good book. Yes that is one of my French Presses, my everyday china and my book in the photo. A French Press is also known as a "Cafetiere" as the French, and ironically the British call them. I say ironically since alledgedly the French and the British do not get along. I blame it on public transport. I mean really, who is at their best crammed into a tube of metal hurtling 100 feet underground, or racing around a hypermarket grabbing wine before the last ferry leaves? Many cross-channel grievances are born this way. Hold the front page, back to my press. A French Press is a glass beaker with a mesh filter contained in the (usually) metal lid. The lid and filter are used as a plunger which fits snugly into the beaker. French Presses require a very coarse grind of coffee, much coarser than drip machines. The very coarse grind means the coffee will not surface above the filter. The coffee grounds are placed in the bottom of the beaker, and water, just off the boil, is added to the beaker, upto 1 inch from the top. Never use boling water, you will crack the beaker. The lid, with plunger elevated, is placed on top of the beaker and left in this way for upto 4 minutes to allow the coffee to develop flavor, color, and body. Next, slowly depress the plunger all the way to the bottom of the beaker. Go as slowly as possible to prevent coffee grinds from escaping around the sides of the filter. Serve immediately and drink within 20 minutes. You'll find that coffee brewed in a French Press will be thicker, darker and stronger, with more sediment than all other methods, with the exception of espresso. With a French Press, the coffee grounds remain in contact with the water the entire brewing time. This, together with using mesh filter over a paper filter means that more of the coffee flavor and essential oils are in the brewed coffee versus being trapped in a paper filter. There is some thought that the sedimentation of French Press coffee can contribute to a minor increase in cholesterol. Coffee served at table with a French Press is an elegant way to end a meal. French Presses are available in many sizes and are a portable way to get fresh brewed coffee while traveling. Why do I turn to this method of brewing coffee when I want to relax with a good book? It's the same reason I have a tea ritual on a rare day off. Brewing loose leaf tea in a teapot requires work. It makes me slow down, appreciate the art of making the beverage, consider where it came from and say a silent word of thanks to all who made it possible as I savor the taste. After a busy week of looking after others, this is Andy time. Spouse and dogs know well not to interrupt once that kettle is singing!